DAWN OF THE DEAD PLAYING CARDS. Overview: Theres no need to gamble, not with 52 different images per deck! 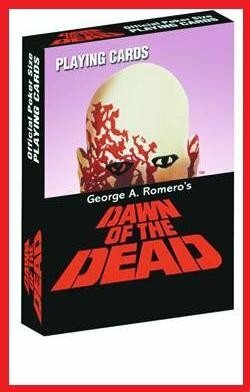 With a lined type finish, official poker size Dawn of the Dead card deck! These playing cards will give players the winning edge! With Blood! Features fifty-two images from George A. Romeros 1978 horror classic.